Policy makers have known for years that activities capitalizing on the world’s vast coastlines are significant drivers of the global economy. In fact, the Organisation for Economic Co-operation and Development estimates that each year activities in the ocean make a contribution of roughly $1.5 trillion in gross value--a contribution that is expected to grow at a rate faster than the global economy by 2030. For that reason, the blue economy—the concept that resources in and around coastlines could be managed more intelligently to increase economic growth while protecting ocean ecosystems—has gained traction in policy circles in recent years. The blue economy concept may be a fad, but could help policy makers more fully consider the marine environment together with economic growth to help meet the United Nation’s oceans sustainable development goal says John Virdin, director of the Ocean and Coastal Policy Program at Duke University’s Nicholas Institute for Environmental Policy Solutions. He’s studying how governments in the United States and abroad might apply the blue economy concept to increase rates of economic return without depleting or damaging ocean ecosystems, which would put not only natural resources but also jobs and economic growth at risk. In January 2017, Virdin and several of Duke’s Nicholas School of the Environment faculty along with researchers from the World Bank, wrote a commentary in the journal Nature Ecology and Evolution that offered recommendations to ensure economic return doesn’t come at the cost of the natural environment. “Finding the right balance between pursuing economic activity in the ocean and protecting the natural systems underpinning that activity means mapping an ocean space and regulating its use on the basis of what the ecosystem can handle,” Virdin said. It’s a process Virdin, Nicholas Institute State Policy Program director Amy Pickle, policy associate Tibor Vegh, and researchers at the North Carolina Sea Grant started for the state of North Carolina. In late 2016, they published a white paper detailing the findings of an economic audit on the state’s ocean economy. The study used data from the National Oceanic and Atmospheric Administration’s National Ocean Watch dataset and employment information from the U.S. Department of Labor to generate a picture of the state’s ocean economy in 2013, finding that it was worth $2.1 billion and accounted for 43,385 jobs. In North Carolina’s coastal counties, 6.5 percent of the gross domestic product and 13 percent of employment was linked to ocean and coastal resources. With policy makers in the United States and now in the Caribbean and Africa Virdin and his partners at Duke and elsewhere are assessing ways to measure the value of nonmarket goods and services to provide a full accounting of the ocean economy—information that will help governments weigh policy risks and rewards. In a Sepetmber 2016 report, Virdin and co-authors at the World Bank aimed to provide a simple synthesis of the blue economy concept and its potential relevance to the Caribbean, in response to questions raised by the region’s finance ministers in a 2015 dialogue connected to the G20. “The report suggests a package of blue economy policies whereby Caribbean countries would measure the value of their ocean economics to better account for contributions received from nature, manage their ocean spaces as a whole rather than industry by industry, and invest in sustainable industries,” Virdin said. Ten principles for investment in a Caribbean blue economy were highlighted in the report to help policy makers create a smart policy that measures economic and environmental benefits. Virdin spoke about the report and the blue economy at the Ocean Conference, the high-level United Nations conference convened in June 2017 in support of the implementation of United Nations Sustainable Development Goal 14 (SDG 14): Conserve and sustainably use the oceans, seas, and marine resources for sustainable development. At side events sponsored by Grenada, a Caribbean country adopting the blue economy vision, Virdin discussed how the blue economy concept might aid small island developing states as well as help to achieve SDG 14. “Our Prime Minister has seen how important these tourism and fishing industries are for the people of Grenada, and is committed to ensuring that our oceans and environment are protected,” said Angus Friday, Grenada’s ambassador to the United States, in a statement about the report’s release. The blue economy concept is also beginning to trickle down to countries that are signatories to the Abidijan Convention. These Atlantic coast countries of west, central, and southern Africa are home to 14 percent of the world’s mangroves, the stilt-like roots of which have adapted to grow in salty, sandy coastal intertidal zones, providing a natural line of defense against storms and sea-level rise. Mangroves also serve to keep vast carbon sinks intact. Removing these maritime forests disturbs the carbon stored in sediment layers beneath them, leading to the emission of an estimated 240 million tons of carbon dioxide annually. Preventing mangrove deforestation is one critical element of a bigger blue economy strategy and is the subject of a recent project by Nicholas Institute researchers Virdin and Vegh, along with other scholars at Duke University, the University of Ghana, and the Universite Sorbonne. This year they completed a feasibility study assessing the potential of international carbon finance mechanisms to help fund conservation of mangroves in Abidijan Convention countries. “With this study we aimed to increase knowledge about blue carbon stocks in the region’s mangroves and the steps that interested communities and countries in the region could take to secure international payments for their conservation and avoided greenhouse gas emissions,” said Vegh. The Abidjan Convention Secretariat is using the report to evaluate the feasibility of mangrove conservation projects in the region. Work on these projects was supported by the North Carolina Sea Grant, GRID-Arendal, the World Bank. 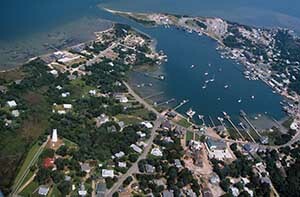 Aerial photo of Ocracoke Island by William Britten Photography.